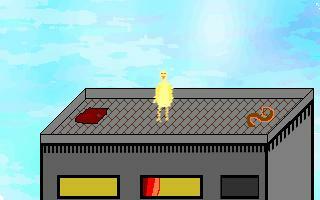 A short game featuring multiple endings. Help a bird find his bee, but can you do it within three minutes? Actually, each character can get a few different endings, ranging from very bad to very good. You could see them as 2+3+3=8 endings, but I'd sell it as 2*3*3=18 endings. Every puzzle has multiple solutions, which leads to the slightly different endings. Anyway, if you've got the patience you can get them all in three playthroughs. I think it's totally worth it, but I might be biased. They're more like different character epilogues if you want to nitpick. Don't worry about the timer, it just leads to a different ending. Graphics and writing were simple in this short MAGS game, but it was quite a fun few minutes. I liked the idea of the time limit and the multiple endings. Being so short means you can play through several times for all the endings before it gets boring. I enjoyed it, even if the graphics are quite poor. Saw two different endings. I think the author has some good ideas, but the puzzles are too simple and seem scarce, even for a 3-minute long game. Of course you can't expect much character development in such a short story, but I think they still are way too unidimensional to make this game memorable.